It was a solid month and a half of pink hair. But I have to keep it fresh- and silver/gray hair is next on the hair plan. 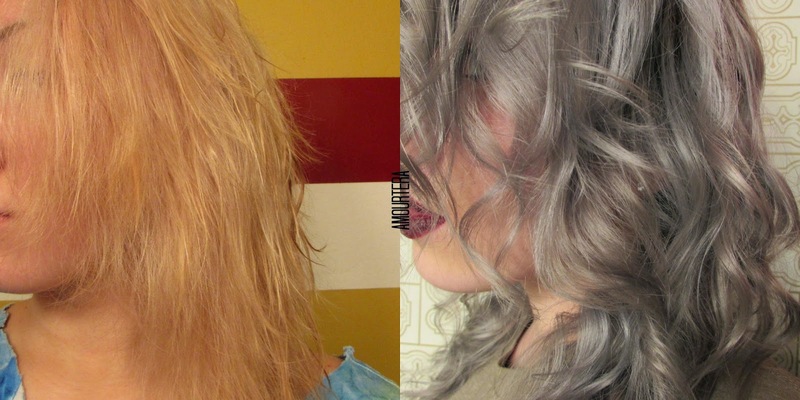 While doing some research, I found that a lot of people who go silver/gray only use Shimmer Lights to tone their hair gray. Well... that did not work with my hair at all! Keep reading to find out what did work (it was beyond easy too)! I took to the aisles at Sally Beauty Supply. While scanning the endless rows of Wella Color Charm boxes for some T18 before I went pink, I spotted a gray box. So, I made a mental note. A week later, I ended up exchanging the extra T18 I didn't use for a 050. Best decision of my life. You're going to need to start with the lightest hair possible. I had used the Wella T18 toner to get my hair light blonde before dyeing it pink. After the pink faded away, I was left with the color you see on the left. Start with shampooed hair, but don't condition. Dry hair and brush it out. For my entire head, I dumped half the bottle of Cooling Violet 050 into my plastic bowl. This is supposed to be used as an additive in other Wella colors to take out warm undertones, but whatever. Then, pour twice as much of the 20 vol developer in (I eyeball it) and mix it together. Put on your gloves, section your hair, and start applying the product. It's on the drippy side, so be careful! Leave the liquid in your hair for about 40 minutes. You should see your hair turning gray. Here's the end result! It's very very easy, and works! Since I'm letting my natural hair color grow in, I've got a brown-to-gray fade going on. My plan is to use my normal shampoo and conditioner. Then, every Sunday, I'll let the Shimmer Lights shampoo sit in my hair for thirty minutes maybe? After, I'll use normal conditioner (or Shimmer Lights conditioner until it runs out and I don't re-buy it). We'll see how well that works and when I have to use the rest of the Cooling Violet 050 for another big toning. Any questions or concerns? Ask away down below! I'm not a certified hair person, so I'm just winging it at home and sharing what worked with me. I'm a teen with a tight budget- if I can color myself then why not? Cooling Violet 050 cost about $5 and the 20 vol developer about $4; so that's two toning sessions for the cost of $9! The developer will have enough left over for another 2 as well!